The devastating firepower of modern weapons helped create the trench stalemate on the Western Front during the First World War. Armies were forced to adapt their tactics and pursue new technologies as a way of breaking the deadlock. Here we explore some of the weapons used and developed by the British Army during the conflict. Weapons played a big part in creating the difficult and unusual circumstances of trench warfare which the British Army encountered during the First World War (1914-18). The destructive power of modern artillery and machine guns forced soldiers to seek cover on the battlefield and dig in for protection. The First Battle of Ypres (20 October-22 November 1914) marked the end of open and mobile warfare on the Western Front. Both sides dug in and a line of trenches soon ran from the Channel to the Swiss frontier. These early trenches were built quickly and tended to be simple affairs that offered little protection from the elements. But they soon grew more substantial. The front line trenches were backed-up by second and third lines: 'support' and 'reserve' trenches. Communication trenches linked them all together. This system was strengthened with fortifications, underground shelters and thick belts of barbed wire. For commanders, the greatest tactical problem was to get troops safely across the fire-swept divide between the trenches to penetrate enemy defences. While modern weapons had helped create this problem, generals hoped that they would also assist the army in fighting their way out of it. Artillery was the most destructive weapon on the Western Front. Guns could rain down high explosive shells, shrapnel and poison gas on the enemy and heavy fire could destroy troop concentrations, wire, and fortified positions. Artillery was often the key to successful operations. At the start of the war the British bombarded the enemy before sending infantry over the top, but this tactic became less effective as the war progressed. Before the Battle of the Somme (1916) the Germans retreated into their concrete dugouts during the artillery barrage, emerging when they heard the guns stop. Later in the war, the British used artillery in a defensive way, rather than obliterate enemy positions. The army developed tactics like the creeping barrage, which saw troops advance across no-man's-land behind the safety of a line of shell fire. They also made the most of new technologies like aircraft, sound ranging and flash spotting to locate and neutralise enemy artillery. 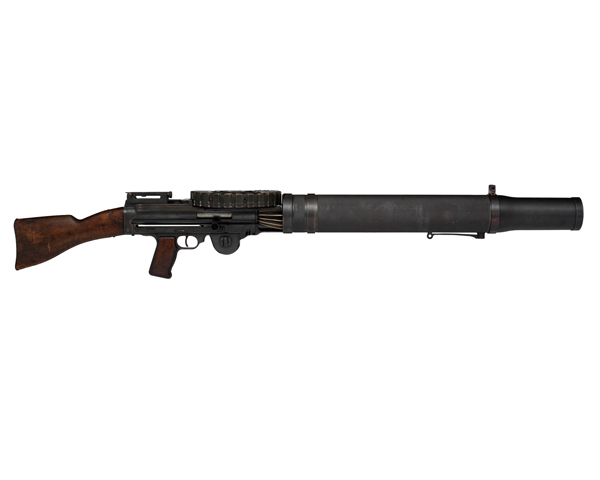 The machine-gun was one of the deadliest weapons of the Western Front, causing thousands of casualties. It was a relatively new weapon at the start of the war, but British and German forces soon realised its potential as a killing machine, especially when fired from a fixed defensive position. The Vickers machine-gun (above) was famed for its reliability and could fire over 600 rounds per minute and had a range of 4,500 yards. With proper handling, it could sustain a rate of fire for hours. This was providing that a necessary supply of belted ammunition, spare barrels and cooling water was available. When there was no water to hand, soldiers would urinate in the water jacket to keep the gun cool! 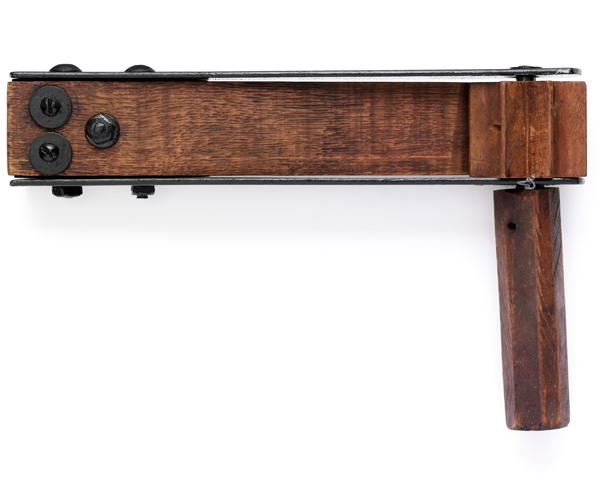 The Lewis Gun was the British Army’s most widely used machine-gun. It required a team of two gunners to operate it, one to fire and one to carry ammunition and reload. As gunnery practice improved the British were able to use this light machine gun to give effective mobile support to their ground troops. The gun was so successful that it was later fitted to aircraft. Aircraft were a such a new technology during the First World War that no one recognised their potential as a weapon at first. Pilots would even wave at enemy planes when they passed each other on aerial reconnaissance duties! 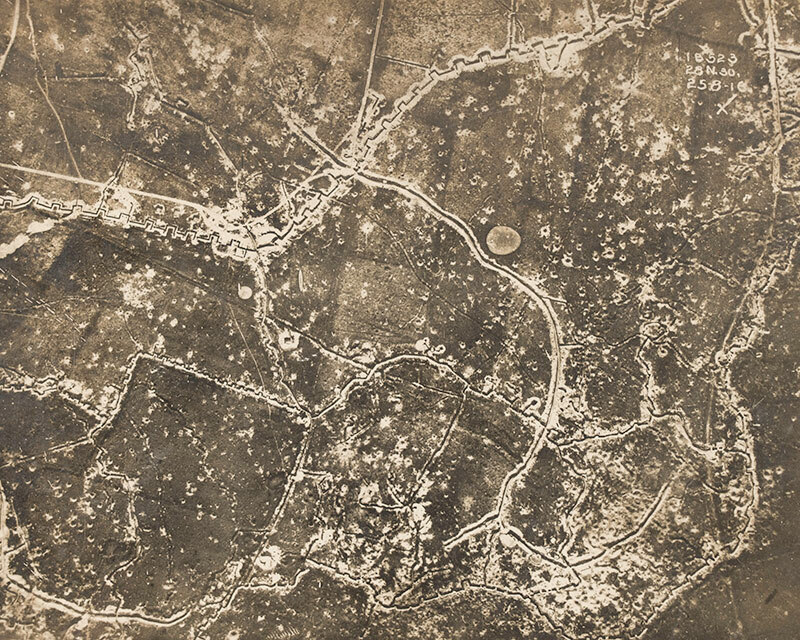 Initially aircraft carried out artillery spotting and photographic reconnaissance. 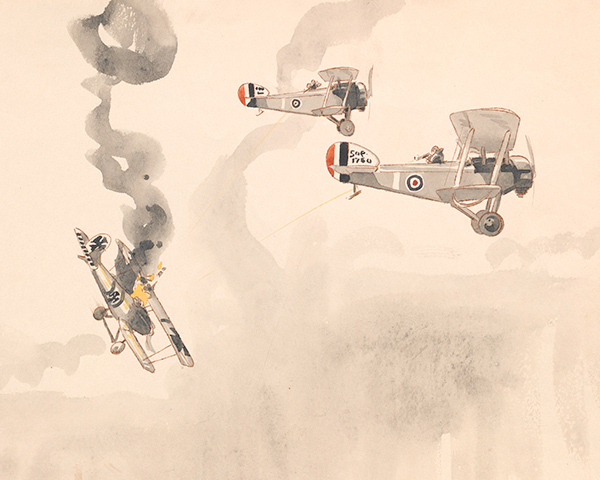 This work gradually led pilots into aerial battles against enemies engaged in similar activities. As the war progressed aircraft were fitted with machine guns and strafed enemy trenches and troop concentrations. As the speed and flying capabilities of aircraft improved they even bombed airfields, transportation networks and industrial facilities. 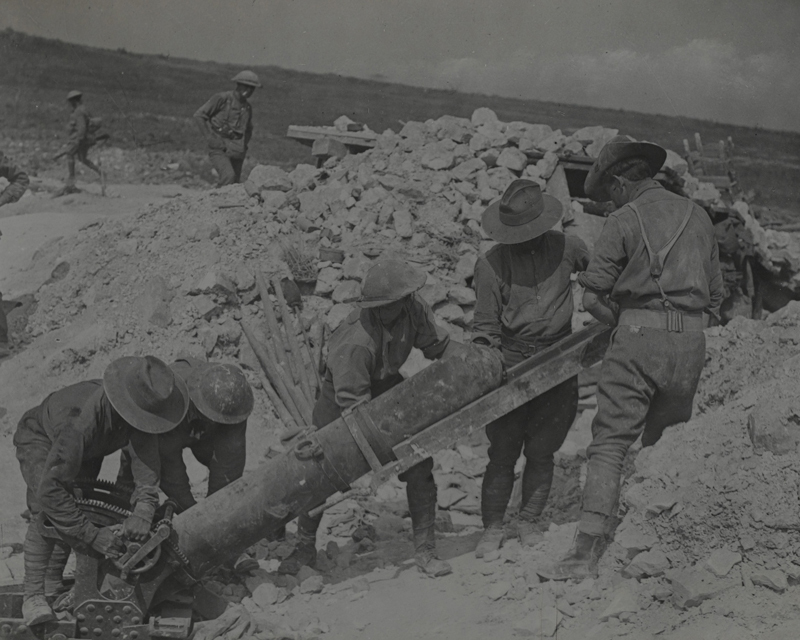 Mortars of all sizes were used on the Western Front. Their size and mobility offered advantages over conventional artillery as they could be fired from within the safety of a trench. They were also effective at taking out enemy machine gun and sniper posts. The Stokes mortar (above) was the most successful British mortar. It consisted of a metal tube fixed to an anti-recoil plate. When dropped into the tube, a bomb hit a firing pin at the bottom and launched. It could fire 20 bombs per minute and had a range of 1,100 metres. 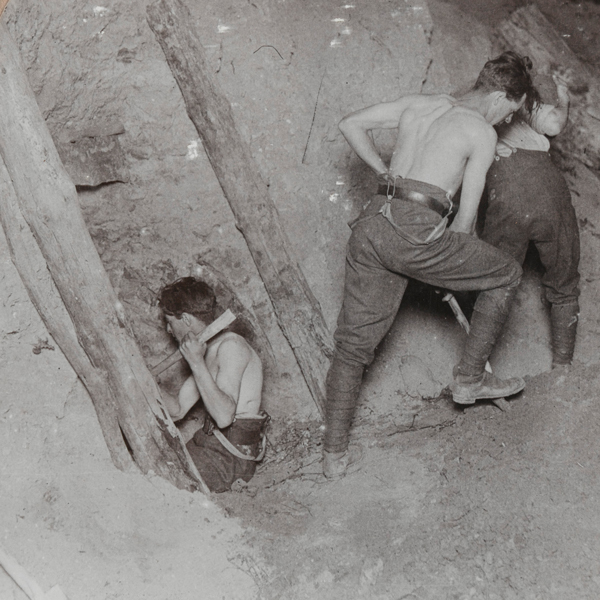 Tunnelling and mining operations were common on the Western Front. Tunnels would be dug under ‘no-man’s land’ to lay explosive mines beneath enemy positions. Much of this work was done by special Royal Engineers units formed of Welsh and Durham miners. On 1 July 1916, a few minutes before they attacked on the Somme, the British exploded several huge mines packed with explosives under the German position. Although many defenders were killed by the explosions. The delay in starting the advance meant that the Germans had time to scramble out of their dugouts, man their trenches and open a devastating machine-gun fire. One successful use of mines was on 7 June 1917, when the British unleashed a series of huge mine explosions at Messines Ridge. They killed around 10,000 Germans and totally disrupted their lines. Following the detonation of the mines, nine Allied infantry divisions attacked under a creeping artillery barrage, supported by tanks. The devastating effect of the mines helped the men gain their initial objectives. They were also helped by the German reserves being positioned too far back to intervene. Rifles were by far the most commonly used weapon of the war. The standard British rifle was the Short Magazine Lee Enfield Rifle Mk III. It had a maximum range of 2,280 metres, but an effective killing range of 550. A well-trained infantryman could fire 15 rounds a minute. In August 1914, the Germans mistook the speed and precision of the British rifle fire for machine guns. The Short Magazine Lee Enfield was usually fitted with a bayonet which gave the ‘Tommy’ a one-metre reach in hand-to-hand combat. A rifle fitted with a bayonet could prove unwieldy in a confined trench so many soldiers preferred to use improvised trench clubs instead. But the bayonet was still a handy tool that soldiers also used for cooking and eating! 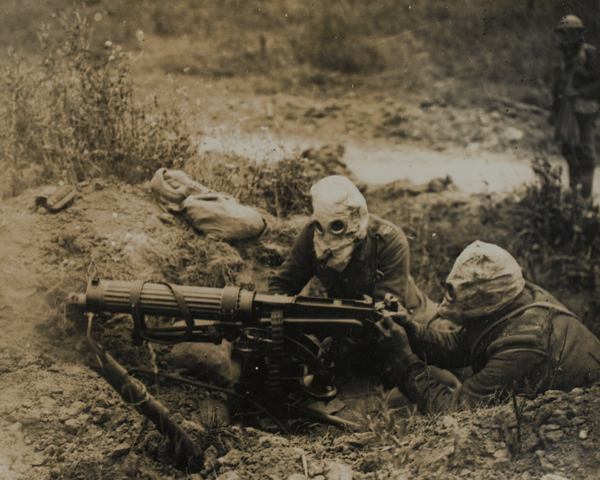 The Germans first used gas against the French during the capture of Neuve Chapelle in October 1914 when they fired shells containing a chemical irritant that caused violent fits of sneezing. In March 1915 they used a form of tear gas against the French at Nieuport. These early experiments were a small taste of things to come. As the war progressed all sides developed ever more lethal gases including chlorine, phosgene and mustard gas. 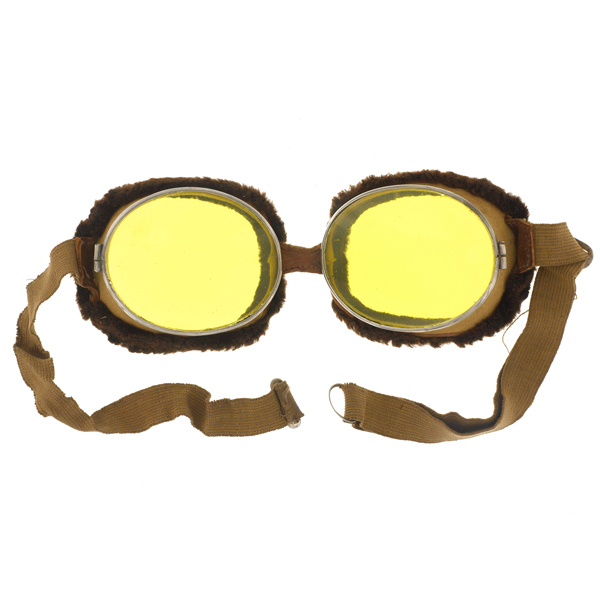 The introduction of gas warfare in 1915 created an urgent need for protective equipment to counter its effects. Rattles, horns and whistles were also soon adopted as means of warning troops and giving them time to put on protective equipment during gas attacks. 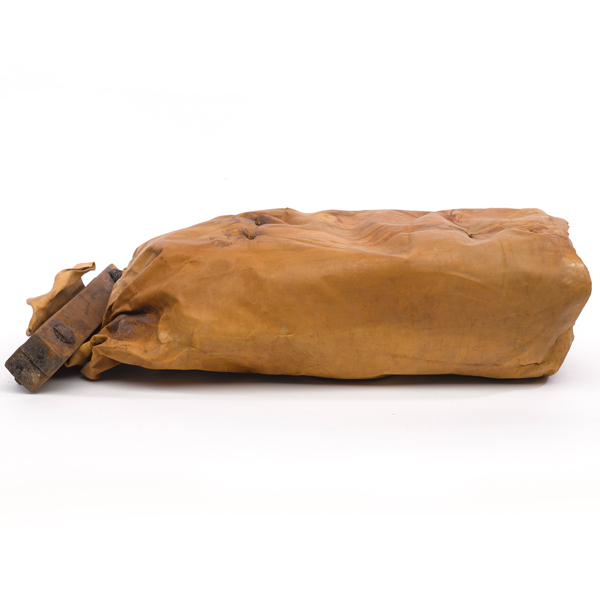 The British Army soon developed a range of gas helmets based on fabric bags and hoods that had been treated with anti-gas chemicals. These were later replaced by a small box filter respirator which provided greater protection. Despite this, the British Empire suffered over 180,000 gas casualties during the war. Not all actions on the Western Front were large scale battles. Often soldiers were involved in trench raids, small surprise attacks to seize prisoners, enemy weapons or gain intelligence. This often involved close-quarters fighting in confined spaces so many experienced soldiers preferred to use improvised clubs, knives and knuckledusters rather than cumbersome rifles. Such weapons were also ideal for silent killing during raids. Reminiscent of medieval weapons, they were often fashioned from items found in the trenches, but were no less deadly and symbolised the primal, brutal nature of trench warfare. Tanks were developed by the British Army as a mechanical solution to the trench warfare stalemate. They were first used on the Somme in September 1916, but they were mechanically unreliable and too few in number to secure a victory. One of the few ways that tanks were effective during the war, was that they were capable of crossing barbed wire defences, although their tracks were still at risk of becoming entangled. 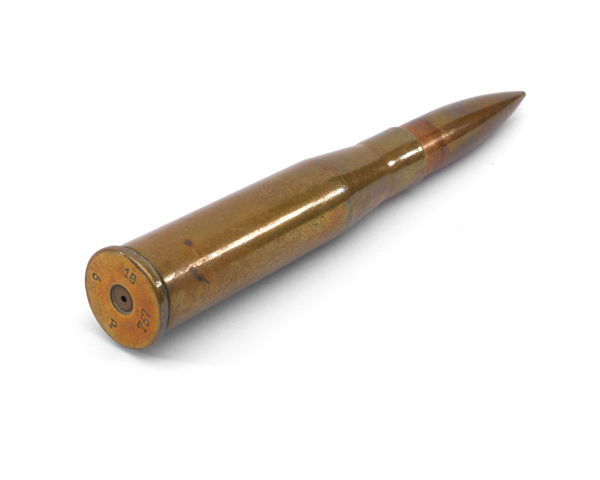 German 13 mm anti-tank bullet, 1918. As the war progressed, the army found better ways to use their new weapon and exploit the advantage it created. At Cambrai in 1917, the tank made its first significant breakthrough when it was used en masse. Technologically, the machines became more advanced. By 1918 tanks were being effectively used as part of an 'all arms' approach during the Allies' successful attacks. But they remained vulnerable to enemy fire and were still mechanically unreliable. The effectiveness of the tank as a weapon, was not fully realised until the inter-war years. Thick belts of barbed wire were placed in front of the trenches on the Western Front. They were placed far enough from the trenches to prevent the enemy from approaching close enough to throw grenades in. Sometimes barbed-wire entanglements were designed to channel attacking infantry and cavalry into machine-gun and artillery fields of fire. Even though it was an agricultural invention, barbed wire made an effective defence. It was cheap, easy to erect and ensnared enemies. It was also somewhat resistant to artillery fire, tangling together further to become more impassable, or being simply replaced if it was damaged. Grenades were ideal weapons for trench warfare, they could be thrown into enemy positions before troops entered them. But they were risky weapons in the confined space of trenches, especially when not handled correctly. Soldiers disliked the Mark 1 Grenade (above) because it was liable to detonate if knocked against something when being thrown. As the war developed, the army also used rifle grenades, which were fired from a rifle, rather than thrown by hand, greatly increasing their range. These were later modified to carry smoke, incendiary devices, flares and anti-tank warheads, as well as high explosive. 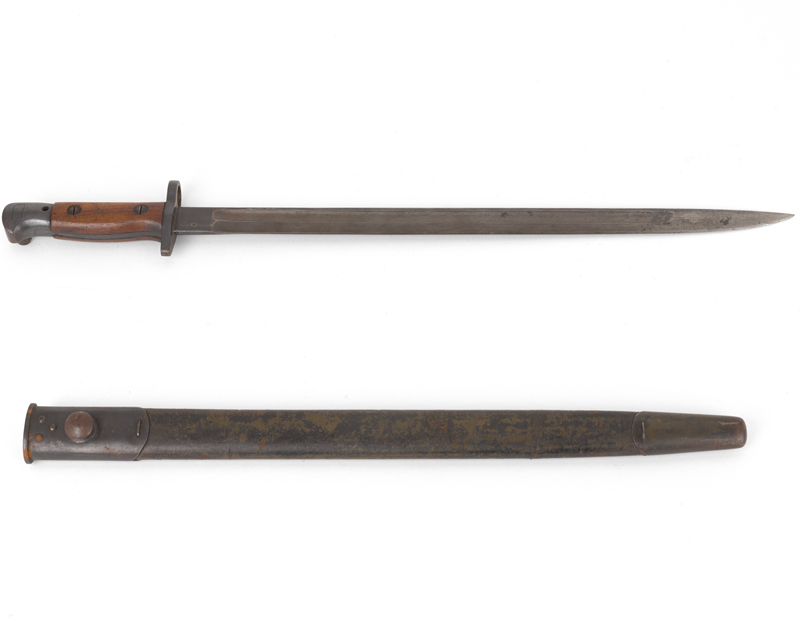 Even though the British Army had an arsenal of weapons at their fingertips, it took them most of the war to use these fighting tools to their advantage. The stalemate was only overcome in 1918 after years of bitter lessons, where the army learnt new tactics that combined the effective use of these weapons. The Battle of Amiens in August 1918 and the subsequent 'Hundred Days' offensive illustrated that the British had learned how to combine infantry assaults (men armed with rifles, grenades and machine guns) with gas, artillery, tanks and aircraft in a co-coordinated attack or ‘all arms’ approach.